No promise you'll reach Buffett's massive net worth, but here's to trying. Try these top investing tips on for size. Warren Buffett, the Oracle of Omaha, has made himself into a household name through legendary investing techniques that have amassed him a $79 billion net worth at 87 years old. 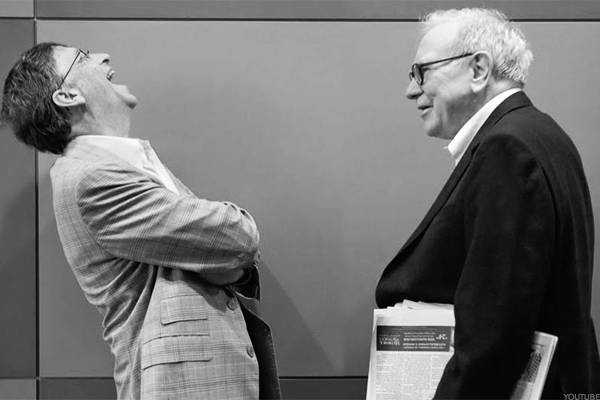 Buffett started playing the markets at the young age of 11, but he's offered sage wisdom on investing for years since he made his first millions. Here are some of Buffett's best tips for making money. In a letter to his Berkshire Hathaway (BRK.A - Get Report) (BRK.B - Get Report) shareholders in 2013, Buffett said his advice for the average investor "could not be more simple." He suggested putting 10% of cash in short-term government bonds and 90% in a "very low-cost" S&P 500 Index fund. In that letter, Buffett suggested Vanguard's variety of funds. Buffett has long sung the praises of index funds. He said pension funds, institutional investors and individual investors find better long-term results with an index investing policy than they would if they employed "high-fee managers." Vanguard's short-term government bond index fund runs a 0.16% annual fee with a $3,000 minimum investment. The exchange traded fund version charges 0.07% annually. If index funds aren't for you, look out for some of Buffett's "moats" -- as in the water-filled ditch that keeps a castle safe from attack. Buffett has called positive free cash flows, good return on capital and strong competitive advantages within an industry "moats" for companies. Investors can flock to those moated names by investing in a basket of Buffett-like stocks through Motif automated investing service for $10 a trade. Although Buffett hasn't approved any himself, the Motif fund focuses on similar investing techniques. But picking winners in today's market isn't always easy. Geopolitical turmoil and volatility threaten to yank the rug out from under market optimism at any time. With that, remember what Buffett said on fear. "During such scary periods, you should never forget two things: First, widespread fear is your friend as an investor, because it serves up bargain purchases. Second, personal fear is your enemy," Buffett said in 2016. "The years ahead will occasionally deliver major market declines - even panics - that will affect virtually all stocks," Buffet wrote in a 2016 letter to investors. "No one can tell you when these traumas will occur - not me, not Charlie [Munger], not economists, not the media." One of Buffett's top picks is Apple Inc. (AAPL - Get Report) . The investor has never sold an Apple share (in fact, he just bought more), and said recently that he sees Apple becoming the first trillion-dollar company. Other big Buffett holdings include Coca-Cola (KO - Get Report) , Wells Fargo (WFC - Get Report) , American Airlines (AAL - Get Report) , American Express (AXP - Get Report) , Bank of America (BAC - Get Report) , Costco (COST - Get Report) , Kraft Heinz (KHC - Get Report) , Southweat Airlines (LUV - Get Report) , Moody's (MCO - Get Report) and Restaurant Brands (QSR - Get Report) . Warren Buffett with long-time friend Bill Gates. If you really believe in the Oracle of Omaha, consider investing in his holding company. Berkshire has outperformed the S&P 500 for the past 10 years. But, Class A Berkshire shares come with a hefty price tag. Class B shares began trading in 1996, and the main difference between those shares and Class A is price. While Class B shares closed recently at $188.93, Class A shares are hovering around an astonishing $285,350. Class B shares have slightly less say in shareholder votes, but they don't trigger a gift tax like Class A shares do. Don't forget that Buffett has had skin in the game for longer than many reading this have been alive - 76 years, to be exact. It takes time to build a fortune, and even Buffett didn't amass 99% of his wealth until after his 50th birthday. With that, choose stocks that can stand the test of time. Certain sectors are always going to be strong, even in a recession - that's Buffett's sweet spot. Forget companies that rely on a strong economy like retailers with discretionary or luxury products and focus instead on moves in utilities or strong brand names. And for what it's worth, Warren Buffett is known for eating whatever he likes and drinking a Coca Cola soda every day. So grab a burger, crack open a cold Coke and start looking for your own moats.